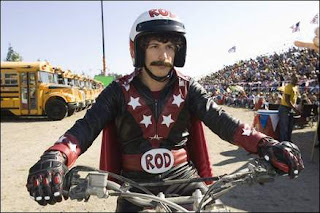 When he fails to combat the rage felt after learning his stepdad is dying of a heart ailment by punch-dancing in the woods Footloose style, Rod Kimble (Saturday Night Live’s Andy Samberg) makes the foolish decision to jump fifteen school buses on his motorbike in the hopes that his stunt will raise enough money for a transplant. The decision is made less out of the goodness of his heart and more because Rod decides he wants to win the old man’s respect by besting the tyrannical stepfather in one of their frequent fights. In this odd comedy produced by Lorne Michaels and Will Ferrell, audiences are treated to an amusing setup and some clever choices in humor. Unfortunately, the film quickly gives way to predictable commercial plot points along with gross and/or uninspired comedy that end up making the movie which starts out entertaining enough wear out its welcome by the halfway point. Despite an enthusiastic turn by Samberg as the young man who, believing his father to have been a stuntman, decides he will follow in the same footsteps with the support of mother Sissy Spacek, friends, brother and cute girl next door (Isla Fisher) as well as a funny cameo from Arrested Development’s Will Arnett, Hot Rod seems to be ultimately passable Saturday Night Live styled entertainment with a rushed feeling that makes it one of the SNL's inferior offerings.